Office Cleaning – Going For Gold! WhIle the worlds focus is currently directed firmly on London 2012, perhaps it’s time for us at Hillson to reflect on some of the ideals of our great athletes and how those ideals may in turn relate to our own business and future success. The objective of the athletes gruelling training and preparation is designed to get the edge on their competition. To prepare for that moment in time when all they have worked on over the years will come together to enable the athlete to perform at their optimum. It takes 20 years to become an overnight success. Being successful in business will require many of the same attributes. Possessing that determination to succeed; attaining and enhancing our skills; guiding staff and passing on ones own experience; implement staff routines that will achieve results; search for and introduce technologies that will smooth-line business procedures or attract customers; learn our rivals strengths and weaknesses; and visualise our future success. Let’s endeavour to do our best and become the Office Cleaning Gold Medal favourites. So you’ve drawn the short straw and it’s up to you to clean the toilets. Good luck with that, this can be dangerous stuff. You may be facing high concentrations of bacteria (Yuck! ), which have the potential to pass on diarrhea or vomiting (Double Yuck!!). Don’t let this disturb you though. Consider the fact that regular, sanitary cleaning of washrooms and toilets are the only way to reduce bacteria numbers and prevent cross contamination. Rubber Gloves used specifically for the toilet – a must to form a barrier between you and those darstardly germs. Make sure you then don’t use those same gloves cleaning elsewhere, we don’t want to cross contaminate now do we. Other products required are a toilet brush, toilet bowl cleaner, sponge, cloths or disposable paper towels and disinfectant. So lets get started. First of all let’s don those all important gloves and wipe down the toilet with the use of a damp sponge to remove excessive grime. Next, it’s time to enter the bowl of terror, where all those nasties are likely to reside. Reach for the toilet brush and toilet bowl cleaner, squirt the cleaner making sure you reach up under the rim. Scrub the bowl thoroughly removing any stains and paying special attention to any marks on the bowl caused by mineral deposits from the water. Flush the toilet whilst still scrubbing with the brush, thus cleaning the brush in the process. Repeat the process by again adding the toilet bowl cleaner into the bowl and scrub. This time do not flush, allow the coloured-aromatic cleaner to become diluted in the toilet bowl water. Let’s return to the exterior of the toilet. Spray with disinfectant then wipe down with a cloth or paper towel. Make sure you get into all the nooks and crannies. Spray and clean the exterior of the bowl, under the seat to the rim of the bowl. Clean on and under the seat, top and bottom of the toilet lid and the cistern – paying special attention to the flush button (an area where bacteria is likely to accumulate). Finally, don’t forget to clean the commonly neglected front and back areas of the bowl. The toilet is now clean, so let’s look to the surronding areas. Look behind the toilet for any hidden grime, wipe down the wall/tiles surrounding the toilet and disinfect the toilet door handle. The washroom usually consits of a basin and mirror. Use windex to clean the mirror leaving it streak free. 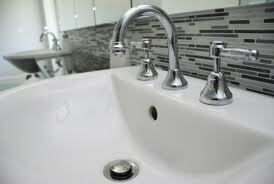 Clean and disinfect the basin and its tapware. Again, make sure you clean in the nooks and crannies. This may require the use of a toothbrush to scrub those hard to get areas. Finally, it’s time to clean and mop the floors. Stand back and admire your handy work. You deserve it. Well done! It’s the beginning of the new financial year so it’s time to square off the ledger, take stock and focus on what’s ahead for the business. Hillson remains a family run business that specialises in providing that personal touch to its customers. Whilst our customer base expands It’s our faith in our highly trained cleaners, their regular supervision, the use of quality equipment and products that give us the confidence and strong belief that we will maintain our customers satisfaction and loyalty. Whether your business be a commercial office, educational institution, medical facilty, in the hospitality or the retail industry, Hillson has the solutions to ensure high quality standards of public health and cleanliness in the workplace. And here’s to TFU, our newest customer. Be assured our mission is to ensure yours and all our customers satisfaction. You won’t be disappointed. June already… How the year has flown! Time for a recap of events for Hillson Cleaning in 2012. The year to date has been another strong year in terms of business growth. We have seen new clients across various sectors - office, hospitality and retail. Recent additions to our list of clientelle is The Bridgewater Club (pictured left), The Woodlands Hotel and the True Thai Massage chain. It’s our company motto that ‘we clean it like we own it’ and to ensure customer loyalty we will bend over backwards to maintain their satisfaction. Building works has been ongoing at a number of our sites, Windsor Hotel, The Carlton Hotel and Atlantis Transport. Naturally our cleaners have stepped up to the challenge. I would like to take this opportunity to thank all our employees for their hard work, loyalty and dedication to their job. May Special Offer: 33% off the initial clean to new clients in the Melbourne area. To be eligibile for this fantastic offer simply contact Kev for a free no obligation quote and advise him of this special offer. We are currently on a recruitment drive and looking for cleaners in Melbourne with experience in the industry who are honest, reliable and have an eye for detail. If you fit this description email kev@hillson.com.au and supply your resume. We’ll be in contact with you shortly. Just purchased a new Polivac high speed floor burnisher for use in bringing that wet look shine to our customers floors. If your interested in details on our burnishing service contact Kev for details. Finally let’s not forget Mothers Day which is fast approaching. Forget the box of chocolates and flowers, consider a unique gift, a clean house. Pamper that special lady with a home cleaning service. Just a thought. Business for Hillson Cleaning is flourishing so we are constantly on the lookout for appropriately qualified cleaners to join our team. We believe our customers deserve the best possible service and consequently, you will need to be experienced in the industry, an honest, reliable person with a keen eye for detail. In order to be considered as a participant in our team you will also need very good communication and customer service skills. Of course there is a lot more we will need to discuss with you in regard to these positions, so please give Kev a call today on 0438-401-459 to find out more or send your resume to kev@hillson.com.au and we will be in contact with you shortly. April Special Offer: 30% off the initial clean to new clients in the Melbourne area. Simply contact Kev for a free no obligation quote and advise him of this offer and you are eligilble. With the building renovations at The Windsor Castle Hotel coming to completion, the pressure on our cleaners is starting to ease. Keeping the Hotel free of builders dust, over the past months, come opening time each day has been a real challenge. Our cleaners have done a job they can be proud of, congratulations. The results of the renovations at The Windsor Castle Hotel are outstanding, uplifting the establishment no end. The customers are abuzz with the bright new outlook, that has resulted in compliments flooding in to the staff. Congratulations to owner Tracey and project manager Ian on a superb job! In order to assist our clients and business the world over we have published our first article giving tips on How To Keep Your Office Tidy Between Cleans. Stay tuned for more advice and tidbits on cleaning and the cleaning industry. Hillson Cleaning have commenced a recruitment drive and are on the lookout for reliable hardworking cleaners in the Melbourne area, with experience in the industry. Contact us via email to kev@hillson.com.au and submit us your resume and contact details and we will get in touch immediately to arrange an interview with you . Alternatively you can give Kev a call directly on 0438-401-459 and discuss with him opportunities available at Hillson and arrange an interview. And remember, not only do we clean at Hillson Cleaning, we also offer cleaning products for the office or staff room. As well as air fresheners, liquid soap for your soap dispensers, WC and urinal sanitisers, toilet paper and hand towels. For more information on how we can leave your business hygienic and smelling fresh don’t hesitate to give us a call. The frequency that cleaners are required to clean premises comes down to the type of business and traffic they experience. For instance businesses in the retail and hospitality industry often require daily cleans in order to maintain a polished image, entice customers and encourage their return business. Office cleaning does not have the same intensity, so many of our customers prefer our professional cleaning to be conducted on a weekly or bi-weekly basis. Tidy Desks: Maintaining a tidy desk assists in work performance and productivity. It also enables the desk to be cleaned thoroughly. Make use of items that will maintain order such as desk drawers for storage, desk organisers, pen holders, In and Out baskets. Wet Wipes: Have at arm’s reach wet wipes or disinfectant and paper towel to clean up any accidents, spillage, coffee marks you may leave behind during the course of the day. Food Storage/Disposal: Food often is a source of odours within the office. This can be reduced by making use of the proper storage facilities such as a drawer or the kitchen refrigerator. Dispose of foods in the bins located in the kitchen or outside office area rather than at your desk. Hang Items: Slinging items of clothing over chairs or desks makes the office look cluttered, unkempt. Make use of cupboards or if not available use hooks or coat stands. File Cabinets: Once any work is completed, file any documents/folders that are no longer required. Aim to keep the out tray clear as well. Not only does it make your desk look tidy but creates order and keeps you feeling in control. Coffee Mugs: Most people enjoy a cuppa whilst working, some can’t work without one. If you fit into this category, make use of coasters to prevent coffee rings on your desk and return mugs to kitchen and clean. Don’t leave dirty mugs on your desk. Pickup Rubbish: Rubbish lying on the floor makes the office look dishevelled even chaotic. A few suggestions, have the bin close by, avoid going for the long hoop shot – it’s amazing how many of us are poor shots and then too lazy to pick up after ourselves. Make sure you pull out staples over the bin rather than letting them fall to the floor embedding themselves in the carpet. Empty the bin when it gets full, don’t allow it to overflow. Air Freshener/Incense: An office with bad odours are off putting for staff and visiting clients. Combat these smells with air fresheners or incense as some of my clients tend to use. Avoid Office Clutter: Tidiness applies not only to the desk, look at the entire office space. Dispose of any unwanted items that maybe on shelves or on the floor. Folders and boxes lying on floors for months at a time are commonplace. If they are not required, move them to where they belong. This helps avoid trip hazards, allows for better cleaning of carpets by cleaners and makes your office look presentable. Start Afresh: Before you leave for the day spend a few minutes to tidy up your desk and office. You’ll appreciate it the next day and if the cleaners are due in that night, so will they. Follow these easy tips, make it a routine and your office will remain hygienic and tidy throughout the week, not just following the professional cleaners. Remember, a clean office promotes a healthy working environment, improved work performance, and supports better customer relations. The excellent results achieved by professional window cleaners comes as a result of many hours of intensive work where one learns the tricks of the trade, whether it be via a schooled professional or more commonly trial and error. I previously listed the equipment commonly used by professionals when cleaning windows and will now explain the technique I use to employ this equipment. Follow this guide and you too can have windows that glisten with that much wanted professional touch. The first step is to fill the bucket with water and add your detergent; my personal choice is Morning Fresh, this will assist in lubricating your squeegee to glide over the surface of the glass. Next add methylated spirits to your water, I do this so as to aid evaporation which helps prevent streaks. We’ll assume the windows we are to clean are free of debris; we’ll look at tips on cleaning windows after a builders clean in a later post. First I would apply the detergent to the glass using my washer. In the event the glass hasn’t been cleaned for quite some time and is covered in grime the doodle bug with its scouring pad will be useful in scrubbing the window. Ensure the pad and the glass are free of any debris that may scratch the window pane. You will eventually develop a feel of the doodle bug and notice that it glides so much easier as it frees the window of its grime. With the glass now covered in your cleaning solution we take a hold of our squeegee and look to the top of the window. Apply the rubber corner of the squeegee along the edge of the glass or you could use a cloth, make sure the cloth is free of lint, like a microfibre. The purpose of wiping the top edge is to prevent solution running down your glass when you squeegee the solution off the glass. For the novice let’s begin with the easiest technique. Place the squeegee horizontally at the top left of the window. Now run the squeegee straight down the window in a vertical direction. Keep constant pressure on the window all the way down to the bottom, with practice you will develop a feel as to how much pressure on the squeegee you will require, too little or too much will leave streaks. Wipe your rubber with a cloth then return to the top and repeat this action to the right side of the area just cleaned, have the squeegee overlap the cleaned area by about 3 cm, repeat this until you reach the right side of the window. The window is now clean so let’s dry the side and top edges with a dry cloth, using your finger to run along the edges. At the bottom of the window you will need to mop up the excess water on the sill then use your dry cloth to dry the bottom edge. Step back and inspect your work. Look from different directions to try to detect any streaks or marks left on the pane. Marks can appear from different angles. Should you detect any streaks use your dry lint free cloth. If there are too many streaks then it’s easier to start the process again by applying the solution to the window. For stubborn marks I tend to use grade 0000 steel wool, designed for polishing glass. Of course the window isn’t truly cleaned until both sides are done. A couple of warnings, on hot days your solution can evaporate quickly, this can cause friction with your squeegee on the glass resulting in streaks. Also, your worst enemy is the sun. A window that looks perfectly clean in the morning may show horrible streaks once the sun shines through so the key is to develop a keen eye for spotting those marks on your window. For the next technique, again for novices, run your dry cloth down the left edge of the pane. Now hold the squeegee vertically and place it along the left edge of the window at the top. Run the squeegee straight across the window in a horizontal direction. Keep constant pressure on the window all the way across to the right side of the window. Wipe your rubber with a cloth then return to the left and repeat this action to the bottom of the area just cleaned, have the squeegee overlap the cleaned area by about 3 cm, repeat this until you reach the bottom of the window. The technique most professionals use is to glide the squeegee across the window in one fluid motion, without lifting the rubber blade, to prevent stopping and starting. This speeds up the process. I start at the bottom left side of the window, move upwards to the top of the window, with the squeegee slopped towards the centre of the glass to allow for run off. Then without lifting the blade, move across the top then down the right side, all the way pushing the detergent to the centre of the glass. Again, without lifting the blade, move to the top of the window, overlapping the cleaned area by a few centimetres and always pushing the solution to the centre. Now snake your squeegee down the glass to the bottom. Mop up the sill, dry the edges, step back and inspect. Correct any blemishes then you’re done. So there you have it, gleaming clean windows, just like the professionals. If you want professional results when cleaning windows you’ll need to acquire the right equipment and learn the proper technique. The equipment is relatively cheap for anybody considering starting a new business or even for the do-it-your-self window cleaners. The technique to cleaning windows isn’t too difficult and most will master it with a few instructions, tips and most of all experience. With experience you’ll develop a keen eye for detail and avoid leaving marks and streaks on your freshly cleaned windows. Window cleaning bucket – these buckets are designed specifically for holding your cleaning solution, squeegee and washer. Sizes range from 10-20 Litres. Window squeegee – for best results don’t skimp on your squeegee. Buy a good quality squeegee and replace the rubber blades often to ensure they have a sharp edge to them. Avoid using the rubber too long as they tend to become rounded and get nicks in them, this will result in poor performance leaving streaks on your window. Washer with scrubber – this is used for applying the solution with a scrubbing pad on one side for removal of bulky and hard waste from the glass. Handheld doodle bug – this holds a scouring pad to assist in removing grime from the glass. Window cleaning solution – of course there are commercial glass cleaning products on the market but you can also create your own window cleaning solution from everyday household products that bring your windows up a treat. There are many recipes available that you can experiment with that include ammonia or vinegar, however my preference is simply water mixed with a tbsp. dishwashing liquid and add a dash of methylated spirits. Scrapper – not all debris or paint can be removed from the glass when cleaning so you will need to resort to the scrapper. Ensure blade is sharp and has no broken edges. Care must be used with this tool to prevent scratching your windows. Ladder – *warning, beware, this is where window cleaning gets dangerous. Ladders account for many household/workplace accidents which can result in serious damage. The ladder I use has a Level-Eze Ladder Leveller. Highly recommend as it assists in stability when on uneven ground. Extension Pole – for those windows that are hard to reach, the extension pole is a godsend. They come in a range of sizes and can be used to attach your squeegee, scrapper, washer and brush. Cleaning windows from the safety of the ground. Holster – the ideal holster will hold your washer, 2 different sized squeegees and a scrapper. This is perfect for ladder use with your equipment at your fingertips. Cobweb Brush – this is a bristled brush to assist in removing cobwebs that are common around external windows. The brush can be attached to the extension pole for those places that are hard to reach. Cloths – lint free white nappy cloths or microfibre cloths used to remove any unwanted streaks or water on your window. Steel Wool Grade 0000 – for that added touch of class. After all is done and you stand back and admire your work, this grade steel wool will polish out most marks you discover, leaving your window blemish free.